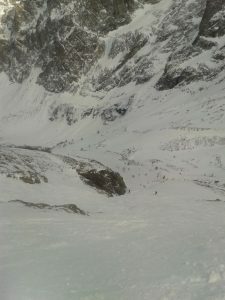 The Couloir de l’Ours in La Grave is one that I had often looked up at whilst skiing one of the common variations of the classic Vallons de la Meije in La Grave, both with friends and with clients. My favoured version of the classic route follows a scenic little valley between moraine ridges which passes directly below the exit to the couloir. From below it looks interesting, and almost cave-like, but it is not immediately obvious how to enter it from above. This winter I ran into Scott, part-time La Grave resident, whilst skiing in La Grave with Colin. Musing where to ski, Scott suggested a run through the aforementioned Bear Couloir. 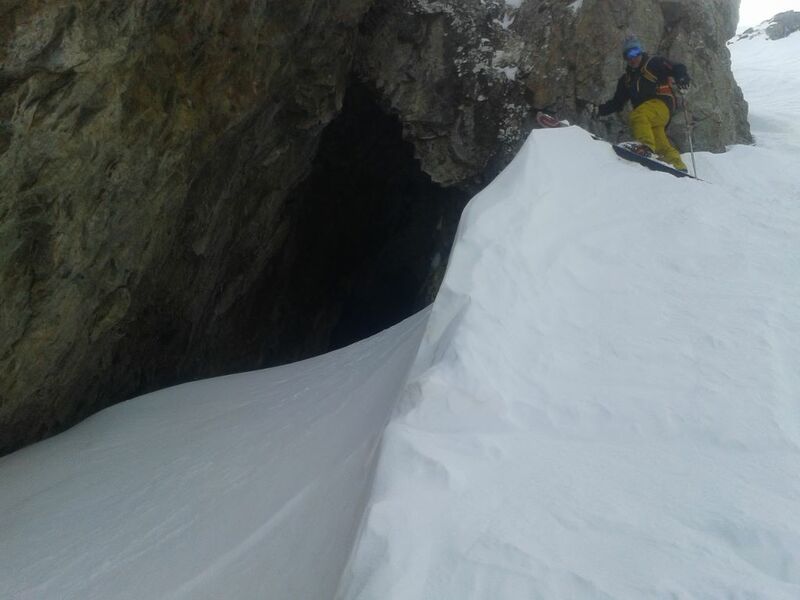 According to him the couloir gets its name because it does indeed contain a cave where a (possibly fictional) bear is reputed to live. Following Scott’s lead we descended from 3200m on the regular Vallons route before taking the low traverse line towards mid-station. Below this traverse there are often alluring slopes of untracked powder to tempt the unwary. As always in La Grave, if something is untracked a few days after the last snowfall there is probably a good reason – in this case, many of these slopes end above cliffs with no way through. You need to know where you are going here. We followed the traverse track to a point directly above the couloir. Open slopes below us funnelled into a gap in the cliffs marking its start. Once inside the couloir is quite modest in length. Because of this it is perhaps less popular than some of the longer, more famous couloirs nearby. It is also less visible from afar so there is no opportunity to impress people on the telepherique or the Chancel Refuge terrace. Show-offs do get the compensation of appearing almost magically from the cliffs before bemused skiers on the Vallons route. For those who appreciate the ambience of a route, the steep rock walls that obscure the view make it feel like you have briefly entered a different world, closed off from the well frequented routes above and below. We didn’t find the bear on the way down but we did get a good view of the cave – see the final photograph. The exit below leads to the floor of the pleasant moraine valley I mentioned earlier – a popular place for a picnic and a sharp contrast to the enclosed descent above. 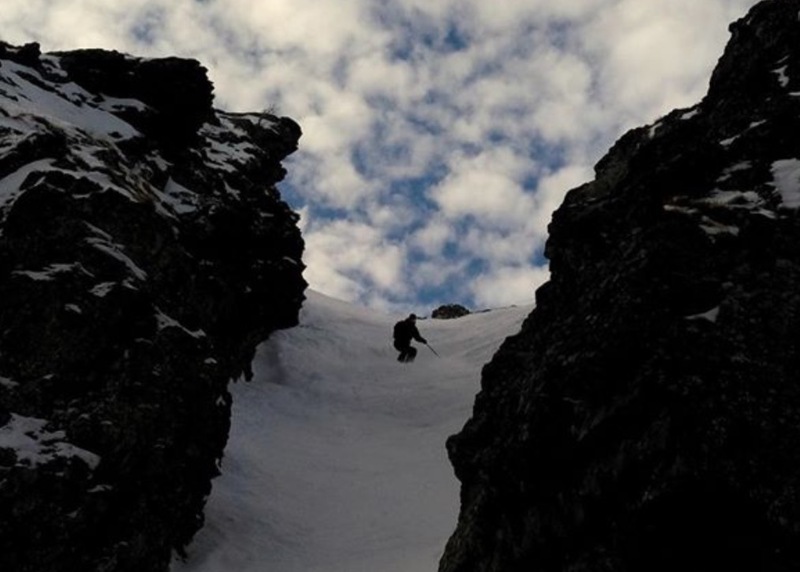 The couloir makes an interesting variation to the Vallons routes with an away-from-it-all feeling in a ski area that is already pretty wild. It often holds untracked snow longer after a snowfall than its better known cousins so it is worth taking the short detour to ski it but it is imperative to find the correct entrance.